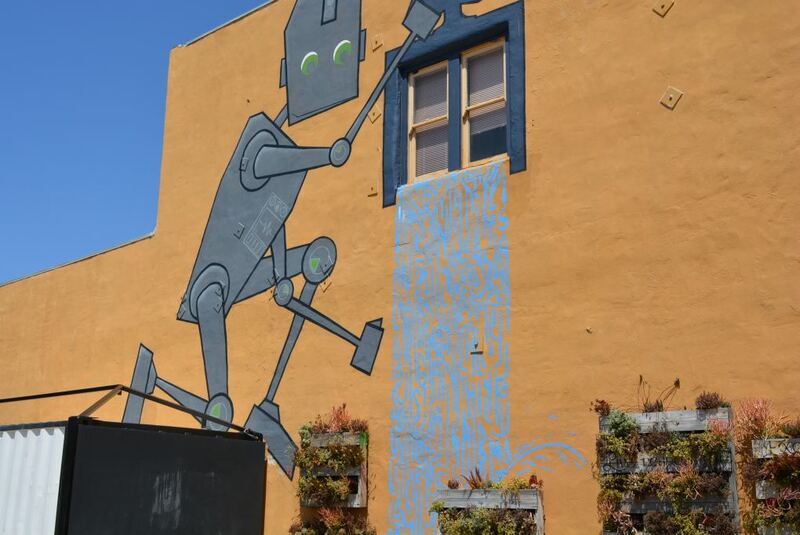 A mural in Carlsbad, Ca. On Tuesday, June 23, 2015. Barbara Starr and I are giving a two-person Presentation to the SEO San Diego Meetup, SEM San Diego Meetup, and Lotico Semantic Web San Diego Meetup Groups, titled Ranking in Google Since The Advent of The Knowledge Graph. Barbara and I have been looking at a lot of patents while preparing for the presentation, and one of the topic areas that we were going to discuss was Quality Scores, since one of the patents that mentions adding “Buy Now” buttons to paid search listings in search results, may do so only if the sites being considered to show buy now buttons have a high enough Quality Score associated with them. While preparing, Barbara pointed out another patent to me that focuses upon low-quality scores. It describes how a site might lose traffic if ranking scores for links pointed to it are below a certain threshold. This patent aims at providing a quality score to resources that link to a site; counting the number of resources in each group, determining a link quality score for the site using the number of resources in each resource quality group; and possibly determining that the link quality score is below a threshold link quality score and classifying the site as a low quality site because the link quality score is below the threshold link quality score. Being classified as a low-quality score site can result in a decreasing of the ranking score for that search result by an amount based on the link quality score, following a formula listed in the patent. The patent points out a few things that might lead to a lower quality score based upon links point to your site. These can include links to your site from boilerplate content, and links from redundant material from the same sites pointed to your site. Enough links like these, and they might result in a “low-quality site” label for your site. Many sites have content on them that could be considered boilerplate content. This could include footer content and sidebar content that doesn’t add much value to pages on a site and is copied from one page to another. This can also include copyright notices, links to things like sitemaps, and others. It appears that when someone links to another site from boilerplate sections of pages, Google may view that as an indication of low quality for the sites being linked to. 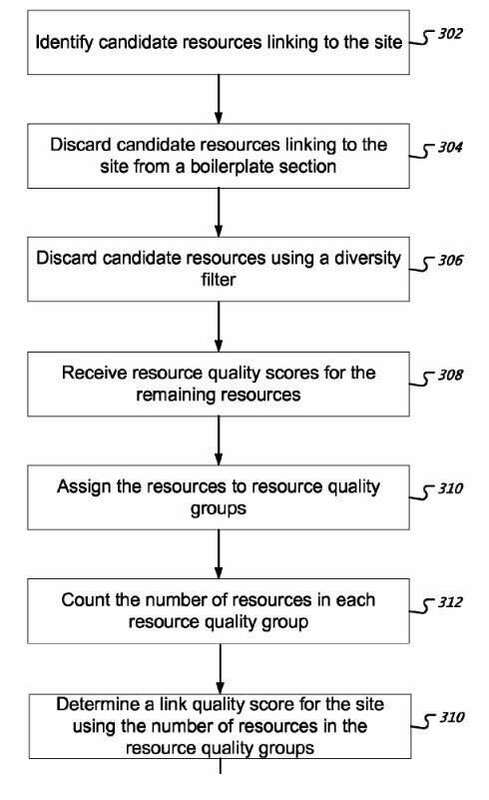 The patent also discusses something it calls Diversity filtering, which is a process for discarding resources that provide essentially redundant information to the link quality engine. If your site provides a resource that links to a specific site and does so on a number of pages, Google may only count one of those links, and discard the rest of them. It may count those filtered links against the site being pointed to, again as a sign of low quality. How a quality score is calculated under the patent. A search system can determine a link quality score for a site using a distribution of resource quality scores of resources linking to the site. The search system can classify the site as a low-quality site if the link quality score is below a threshold score. When providing search results, the search system can decrease the ranking score of a site classified as a low-quality site, which can result in higher quality sites being provided to users instead of low-quality sites. Methods, systems, and apparatus, including computer programs encoded on a computer storage medium, for enhancing search results. In one aspect, a method includes receiving a resource quality score for each of a plurality of resources linking to a site/ Each of the resources is assigned to one of a plurality of resource quality groups, each resource quality group being associated with a range of resource quality scores, each resource being assigned to the resource quality group associated with the range encompassing the resource quality score for the resource. The number of resources in each resources quality group is counted. A link quality score is determined for the site using the number of resources in each resource quality group. If the link quality score is below a threshold link quality score, the site is classified as a low-quality site. 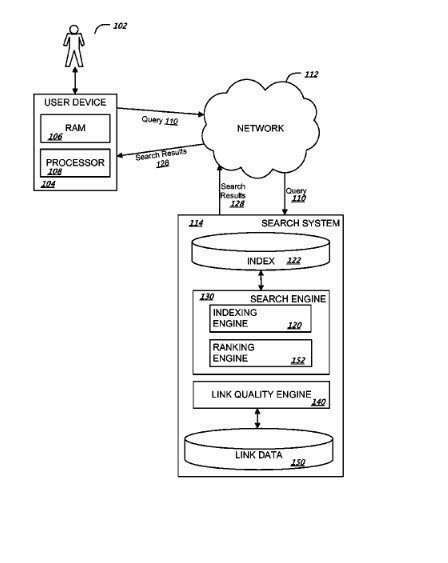 Googleâ€™s Quality Score Patent: The Birth of Panda? The argument that Google seems to make about decreasing rankings for sites that seem to be low quality is that doing so raises the rankings of sites that are of higher quality. Very interesting analysis. Correct me if I’m wrong here, but you’re saying this patent could be an indication that “designed by” or “SEO by” footer links could be hurting the design or marketing site (my situation interpretation). I know there is some debate in the webmaster community about links like those, but I still see companies using them all the time. Is this the patent to shift that argument against using links like those? I’m disappointed I can’t attend your talk; I know it’s going to be a great one. Huge fan of your blog and the patent analysis you do. Those designed by links could fit into a description of links in boilerplate, but I think it purposefully covers a wider range than that, but yes this would be a message that those aren’t necessarily a good idea. It’s a shame you can’t make it. I will be posting the slides from the presentation at some point. I agree with Bill, these sort of links are bad news if you are expecting them to help you with your rankings. A number of years ago I went through a number of clients websites and used them to link back, which lead to a link penalty very quickly. Realising this was the cause of the problem, I removed them and the penalty was lifted once again. I would personally avoid using them unless you just include the name of your company and do not link back to your website. Nice post and analysis. As Eric points out and as you know, there is/has been debate about the effectiveness and relative quality of footer links – site-wide or otherwise, with many SEOs coming out against them – at least in public. Regardless of whether they should be used or what is quality/low quality, they are being used extensively and I know of many industries that relay on these for their page 1 rankings. In fact, just look at the local web design industry. “San Diego Web Design” or ” Web Design LA “. Whether the clients sites they build contain optimized anchor text or just a brand name, close to 100% of these sites point back (site-wide) in the footer, to the design firm. Further analysis pretty consistently shows that these links are the vast majority of links in the design firm’s link profile and, that they are key in the rankings. Not arguing or telling you anything you don’t know, just interesting to note that A) I don’t think this is in full effect yet, or possibly, it’s only applicable when it stands out (as in, not in a vertical where all sites do it), and B) I wonder if it will apply to Google pages where they utilize side-bar/footer/boilerplate linking for their own dofollow links. That sounds like a reasonable suggestion. Getting your name out in a positive way like that, without using such a spot for links sounds very reasonable. Thank you. It’s good seeing discussions like that taking place. We’ll have to wait and see if and when this goes into effect, what kind of impact it might have. I hope you can do more follow up’s to the Google Threshold. Also is there any connect to the speed of the backlinks being built? Very interesting because I was much more focused on other signals, especially “on page” (like one can find on content farms). It seems easy, since Google is good at data mining, to analyse the surrounding of the content. Also, more than ever, the power of the domain is key. nope I wouldn’t recommend that as well…since even citations like those are weighed and anything not given editorially will be hit one day or the other, if not today. Yes these links from boilerplate areas had long been devalued and it is part of Panda in my experience. While this practice of having linkbacks on free themes/software was wide spread in the pre panda days, it might not work anymore. such a helpful post thank u BILL for enlighten me by those really important matters which r so necessary for the beginners on seo market like me.this post will be help me a lot so thank you again. Happy that you got some helpful information from this post. Sharing stuff like this is how I learn about it, and using comments to discuss what are in posts are write helps to reinforce that information. I haven’t seen anything about mentioning entities in Boilerplate content on a page, in a way that might potentially be harmful to the entity (or business, in this case) being mentioned. Having the text “site designed by the ABC Design company” doesn’t doesn’t seem like it would be harmful, based upon this patent that is focused upon how linking behavior might result in a negative quality score. When I think of signals of “quality content,” I find myself thinking of the content on a page itself, too. But I think you’re right in that Google is analyzing the context of that content, and the things that surround it. Do pages that tend to be l;osw quality tend to have lots of links pointed to them by links placed in the boilerplate of pages? It’s quite possible. The behavior is that of someone trying to manipulate rankings with links, without necessarily getting in trouble for having sitewide links. Good point. The patent talks about that threshold in more detail, and you are welcome to click through to it, and try to learn more about it. The patent doesn’t talk about the speed at which backlinks are being built at, but it seems like one of those links placed in boilerplate is too many, and will count against the site being linked to, and many links like that will count against it even more. Glad to hear that you got some useable information from this post. Thanks a lot for such a interesting article .You have clear many of my doubts.keep posting this kind of article. @MichielVK – I envy any client you have that would allow you to place a summary of your company in the footer of their website. I think it would be an unrealistic expectation that any client would allow that. Like I said, I’m sure if you were to place just your company’s name in the footer of their website without linking out, this would be playing it safe and still gives your company some exposure. Sure, there’s no link juice, but considering Google is clearly against that form of linking, it’s the ideal solution. Thanks for sharing this information. By the way, love the analysis that you’ve put in too. Now, this patent seems to be legit. I mean, if this is to be implemented right away, a lot of sites, may it be a small blog or a big company website will be sorted out and the searches will be much secured. However, my concert is about the footer and sidebar content. I, for one, have used these methods not to imply redundancy but as guides or a summary of the all the things my site has. I know that there are a lot of sites out there that uses the footer and sidebar contents to get away with some shenanigans stuff but if this method is done right, it could also be a good help isn’t it? With this mentally, I bet google will be thoroughly reviewing this patent to ensure a firm rule towards this matter. I could see sidebars and footers used well, but they also suffer from misuse as well. It is good seeing Google experiment and give thought to these areas. I have recently found myself in an SEO based position. Not a day goes buy where I feel like I have not learned something new. I’m amazed at how complex the process is and articles like this really help. Thank you. Happy to hear that you learned something from my sharing information about the patent. Such a beautiful article. Classification of blogs or website from Google is done to check and to block the low qualified sites. By keep reading the updates from this blog makes some changes in it. It’s interesting tracking the updates that Google makes in issuing patents that address issues like these. Am I right in understanding that Google will punish you for having multiple links to one site even if they are relevant and therefore not spam? I’m thinking about footer links, citations and client portfolio work. If so, I may be in breach of their best practices. It’s possible that they don’t necessarily want you pointing all of those links to your site. as of now i am thinking as a low quality content and low quality back links are impact to our site but regarding this article i have learnt more things.Thanks for sharing this article. A little knowledge can be a helpful thing when trying to decide upon next steps to tak. This is the nice post Bill. I am just new to Search Engine Optimization. So, this post really help out the guy who are just new to SEO like me. Nice article Bill, with great insight as always. The section on boilerplate links is especially interesting. I’ve long believed that footer links are outdated for SEO benefit. They’re devalued at the very least and could have a negative impact on rankings (if not not now then very soon). For web designers, agencies etc, a safer way to get credit for your work is to have a no-follow link on the footer. There’d be no link juice passed but you get a citation, branding, and traffic potential. If you really want a followed link, don’t put in the footer, try to get a contextual link on another page – a site credits page for example (featuring some information on everyone who worked on the site). Thoughts? I agree with your suggestions about the nofollow link, and about a sites credit page that might offer a contextual link. That sounds like a good approach. While you do get recognition for your work by adding a link on the bottom of a clients site, whether it’s no-follow or do-follow, I still think it leaves a massive footprint which would allow your competitors and even Google to reverse engineer your clients sites and find out what you’re doing. So my advice is just be a little careful! Hi, not sure but this seems to be a on-page seo talk, and with google trying to figure out what is best for the reader. If any of the filters worry you, maybe it would be a good thing to focus on quality content and I believe you will win big, and be rewarded by google. Exactly what is “good content?” I don’t know that we have a definition for that anywhere. Yes, Good quality means Good Content; Since Google published a patent that describes how they might try to identify low quality sites, trying to understand what they might perceive as high quality seemed to make sense to me. It seems competitors use the backlinks to their sites and get away with it, but I can see how it could be a problem.